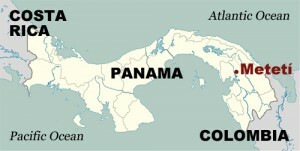 Two IU students participated in a recent Movement Exchange trip to Panama. Here students dance with the children of Arimae. Panama photos courtesy of Movement Exchange at IU. Indiana University Bloomington students Dana Vanderburgh and Clare Donohue are international movers and shakers. 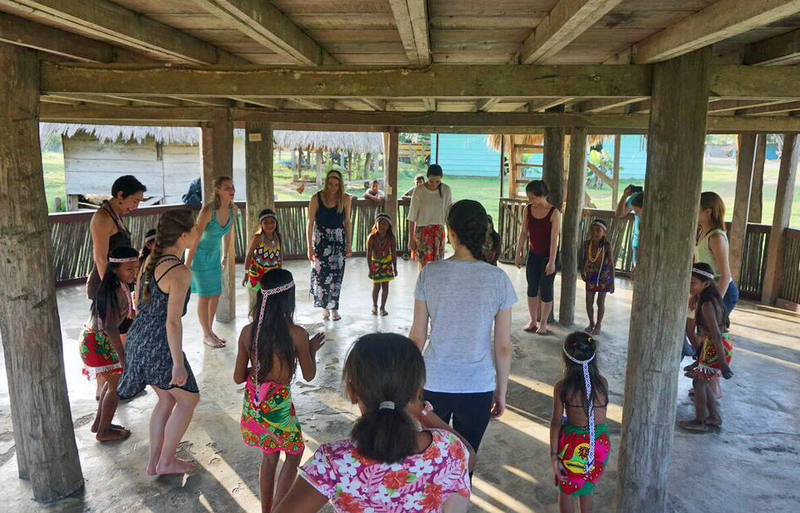 They rang in the new year as “Dance Diplomats” in Metetí, Panama, along with other members of Movement Exchange from Butler University and the University of Cincinnati. From Dec. 29 to Jan. 5, the students participated in an outreach program built around creative expression, cultural understanding and fun. 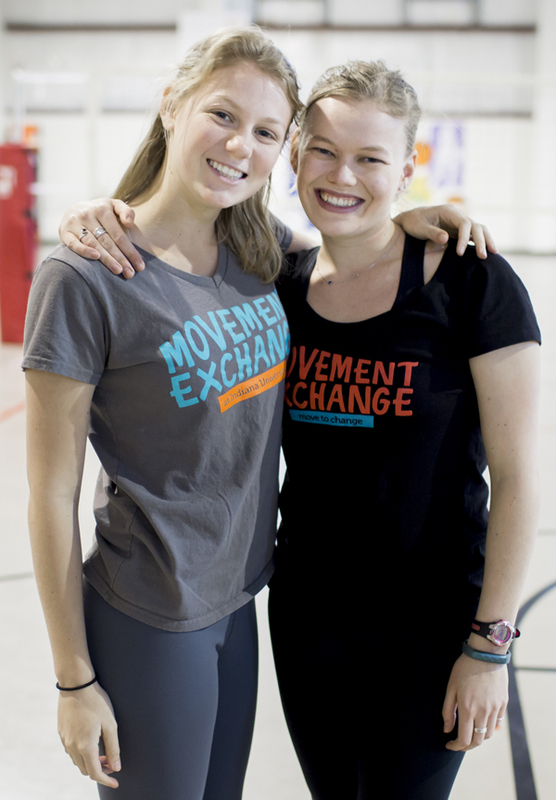 Movement Exchange was founded in 2010 by a recent graduate of Harvard, Anna Pasternak, who wondered how dancers could make a difference in the world. The first university chapter was established at IU, and the organization has since expanded to 20 other college campuses. Donohue is a freshman from Schaumburg, Ill., a direct admit in the Kelley School of Business and a member of the RedSteppers. She joined Movement Exchange at IU after learning about it from a member of the dance team. 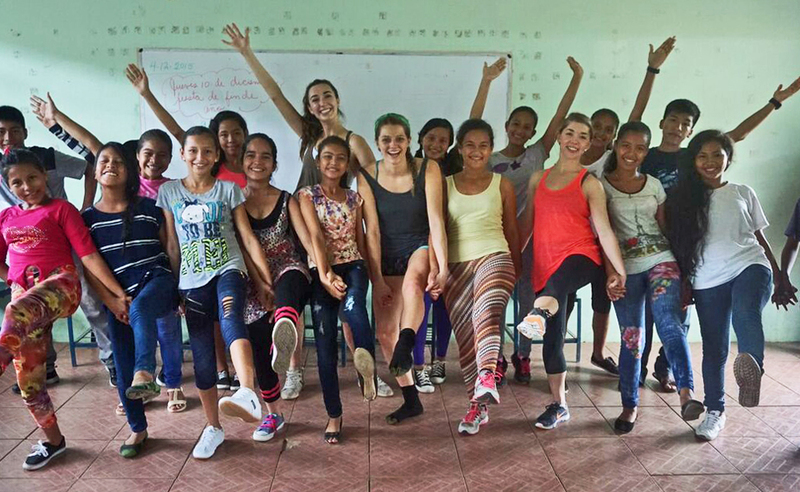 IU’s Clare Donohue, left, and Dana Vanderburgh recently traveled to Panama with Movement Exchange. Vanderburgh came to Bloomington from Wayland, Mass. as a ballet major. After her freshman year, injuries forced a change of plans. She learned about Movement Exchange from a friend, and soon discovered it filled a void. Last year, Vanderburgh participated in her first exchange to Panama. “That experience put me on the path to study dance for youth empowerment and social change,” she said. She is now in the third year of IU’s integrated B.A. and M.A. program in international studies, offered through the School of Global and International Studies in the College of Arts and Sciences. She also serves as outreach coordinator for Movement Exchange and president of its IU chapter. Though both IU students have significant dance experience, they each stressed that the organization isn’t just for those with formal training. “Not at all, it’s for anyone who likes to dance,” Donohue said. After several flight delays and cancellations, Vanderburgh arrived in Panama City. She met up with her peers, then the group traveled by van for more than five hours to Metetí. 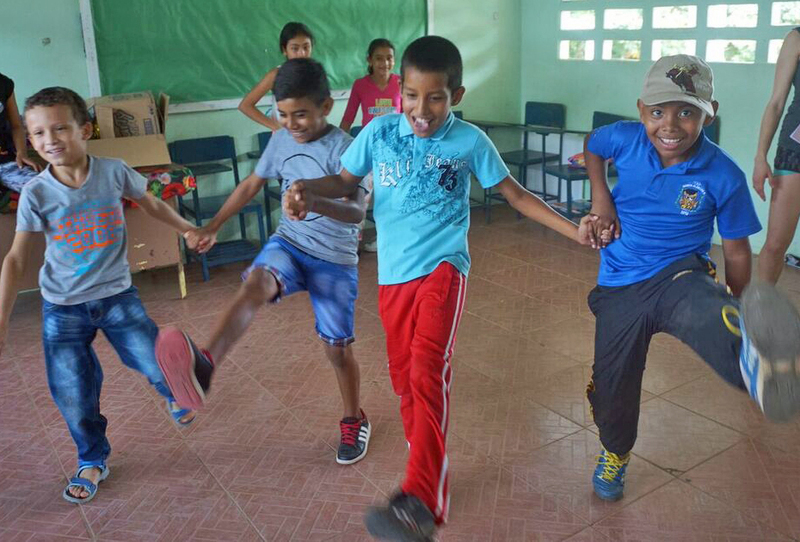 The boys of Metetí shared the joy of dance, too. The members of Movement Exchange started their days with breakfast at the school, then taught dance to the local children for three hours before heading out on excursions in the afternoons. They traveled deep into the land, visiting a local farm and two indigenous communities. In one, the women wore no shirts. The homes had roofs fashioned from leaves and metal scraps. But what stood out most was the open, welcoming nature of people. Their group had been invited to the communities through word of mouth, and that had made a world of difference. For Vanderburgh, the visits were a stark contrast to how tribes in Central and South America are often exploited for tourists. Dance was the primary form of communication between Movement Exchange members and the children of Metetí. The dancers not only interacted with children, but also with parents and school staff members. Word about the visitors rippled through the small community. They were invited into a home, where the host prepared “the most amazing” meals. Their bus driver seemed to know everyone, and it opened doors. Soon they were invited to visit a naval base and a radio station, where news about the show they were preparing with the children was broadcast to the entire province. Most of their time, however, was spent with the children of Metetí. After just three days of classes, they managed to learn 10 pieces of choreography across the three age groups. “That was a really incredible experience to see that come together, and just watch the progression over a few days,” Vanderburgh said. Movement Exchange is out to change the world, one step at a time. The program started with exchanges in Panama and made its first forays into India in 2015. Clare Donahue, center, leads girls during a weekly Movement Exchange at IU workshop at Girls Inc. in Bloomington. The group’s focus is not only international, but also local. The IU chapter is engaged in outreach here in Bloomington. 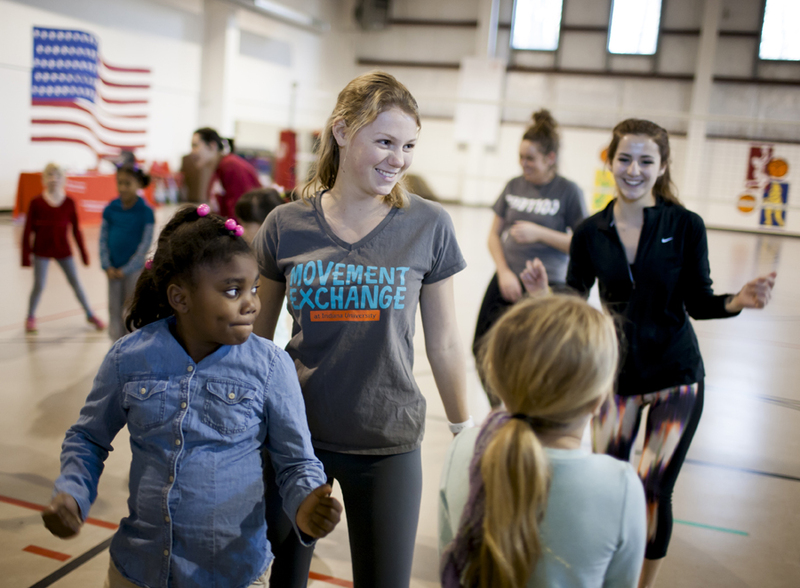 The 15 members of Movement Exchange at IU work with Boys and Girls Clubs and other local organizations. They lead workshops with local youth, including weekly sessions with Girls Inc. In a recent workshop at Girls Inc., Vanderburgh, Donohue and a handful of other members led an enthusiastic group of girls through new steps, dance games and chances to express themselves through their own moves. For an hour, the sounds of laughter and moving feet filled the gym. Dance is a universal language. It is human connection. But for the girls, it’s much simpler than that: it’s fun. “You can really watch how something as ‘little’ or ‘insignificant’ as dance has an impact. It’s not just the actual dance, it’s your willingness to connect with someone through dance,” Vanderburgh said. The recent trip to Panama left a lasting impact on both IU students, too. Donohue said the trip has strengthened her interest in international engagement. She hopes to earn the international business co-major in the Kelley School of Business. “That has been my thing ever since I came here. I want to see the world. I love to explore. I would be so lucky if I had a career that allowed me to do that,” she said. Vanderburgh, who found new direction through Movement Exchange, was equally stirred by her return trip to Panama. “There is hope for this world. That’s what I took away from it this year,” she said.